Hi guys! It’s biscuit time! I have a real treat for you today. 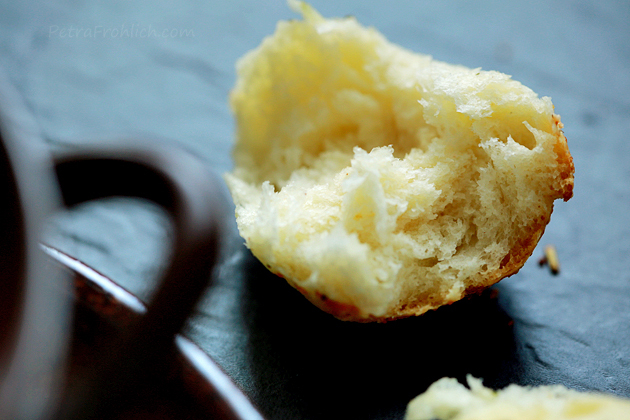 If you like biscuits, then I am sure you will become fans of these potato ones. Us, in the little household of ours, definitely are. 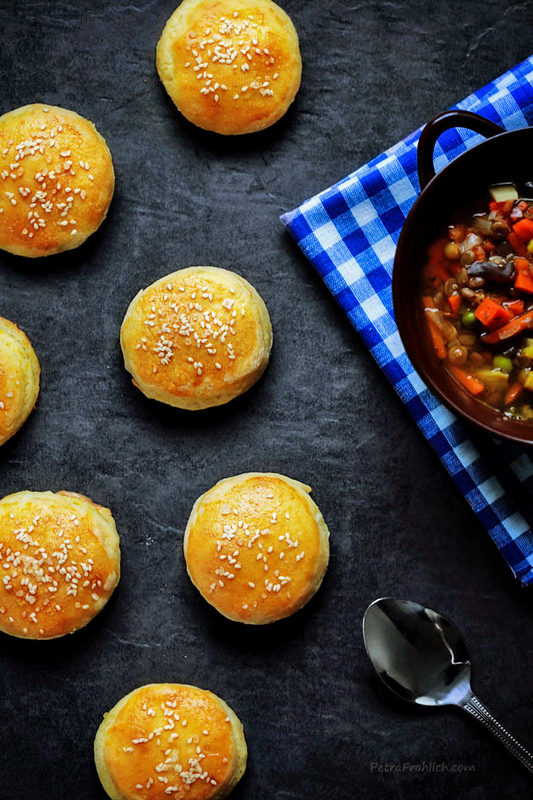 These biscuits are soft and flaky, almost like puff pastry. 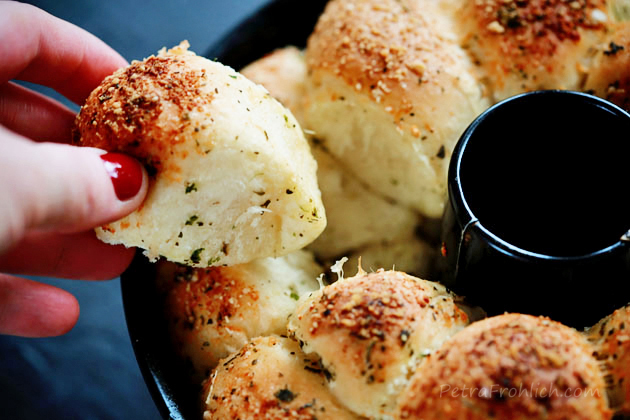 They are full of gorgeous buttery flavor. And they even have potatoes incorporated in them which adds them a new, unusual and very tasty dimension. In a bowl of your stand mixer, combine the flour and the dried yeast. Add the warm milk, water, 1 tsp salt, vegetable oil and mix until combined and not sticky (about 10 minutes). Allow the dough to rise for about 1 hour or until doubled in size. 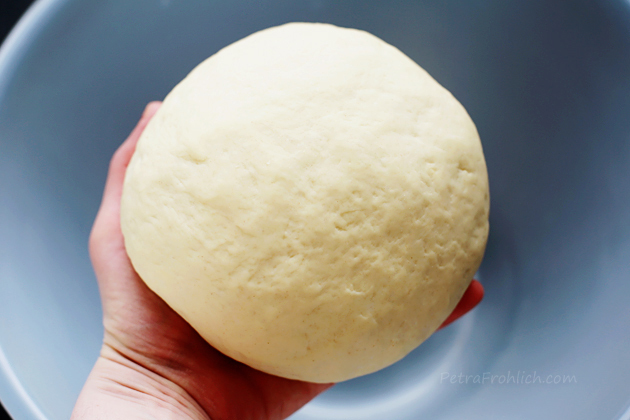 Place the dough on a well floured surface, roll out to about ⅓-inch (1 cm) thickness. Grate the butter and the potato over the surface of the dough. 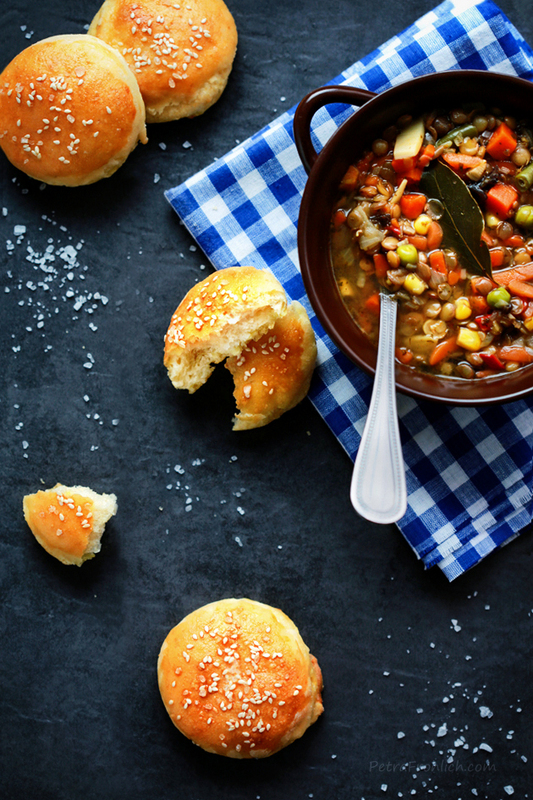 Sprinkle with ½ tsp salt. Fold the dough in half. Then fold into thirds. Roll out again into about ⅓-inch (1 cm) thickness. Allow to rise for about 20 minutes. Line baking sheets with parchment paper. Preheat the oven to 350 °F (175 °C). Using a 2.5-inch (6.5 cm) floured round cutter (or the edges of a glass or mug), cut out rounds. 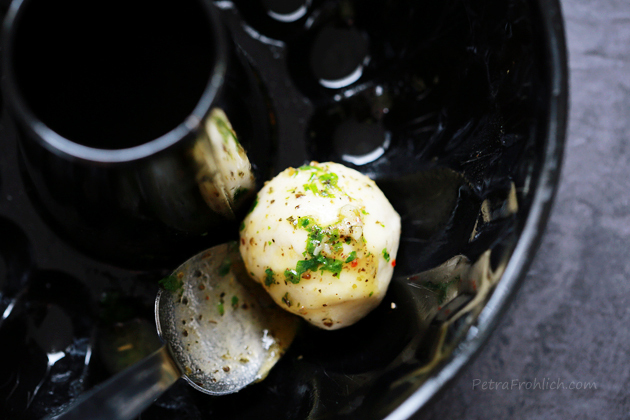 In a separate bowl, whisk the egg lightly. Brush the top of each biscuit with the egg wash, then sprinkle with the sesame seeds and the coarse salt. Bake at 350 °F (175 °C) for about 25 minutes, or until golden. 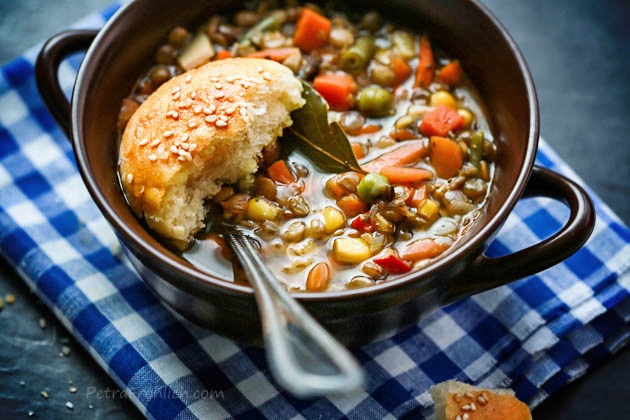 This recipe was adapted from here. 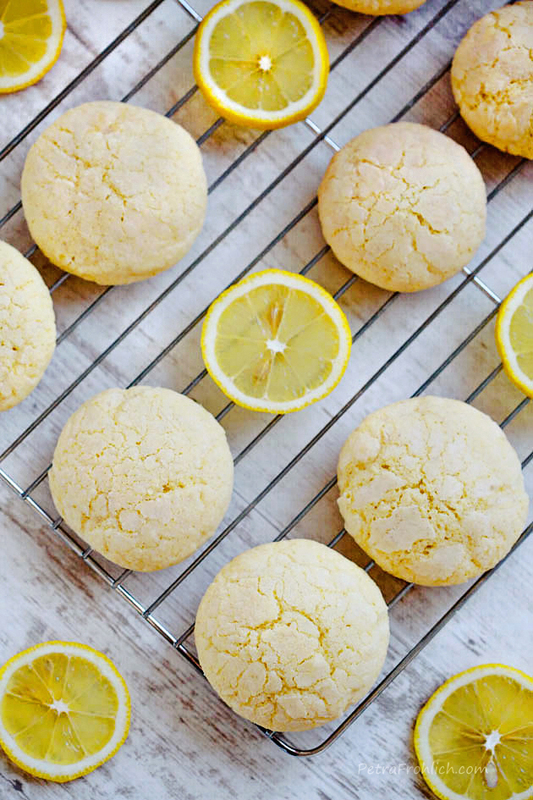 I have a real treat for lemon lovers out there. 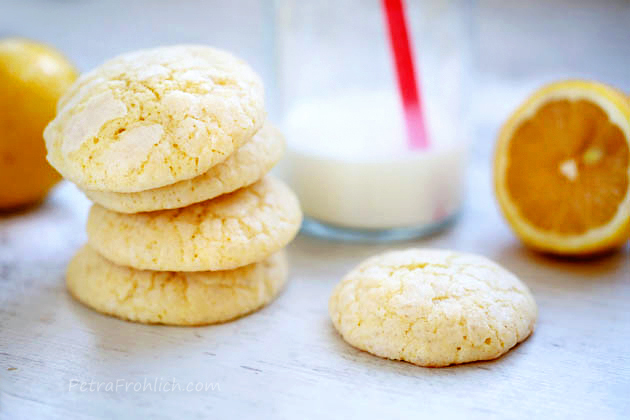 These wonderful lemon cookies will touch your heart. 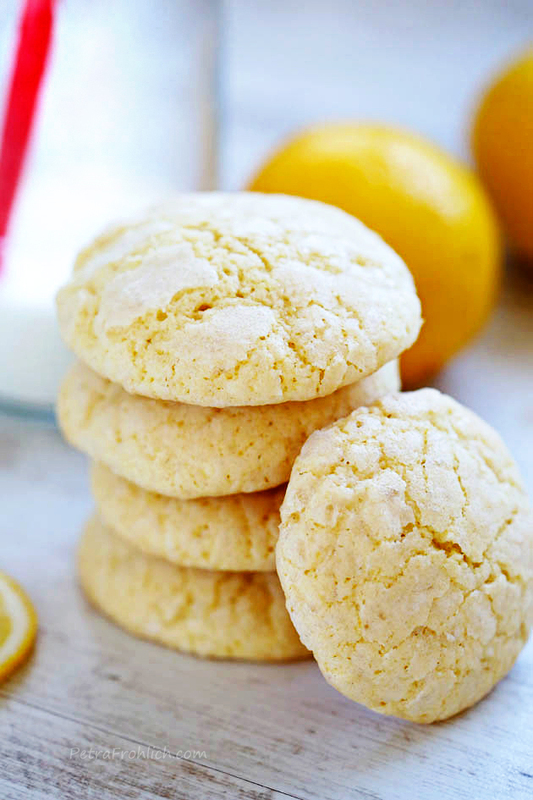 Containing lemon juice and lemon zest, they are packed with rich and fresh lemon flavor. It’s the real deal, guys. 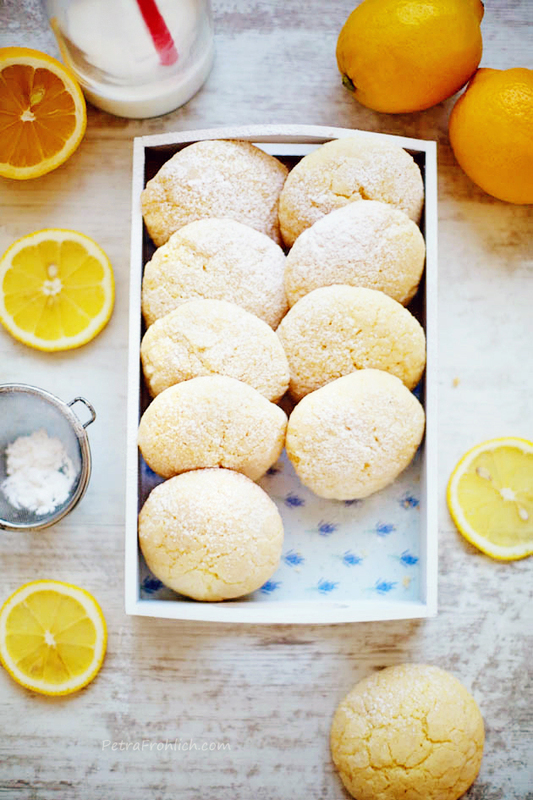 Tender and crumbly, dangerously addictive with their melt-in-your-mouth quality and powdered sugar coating. I wish I could deliver their scent to you right now. Soooo amazing! 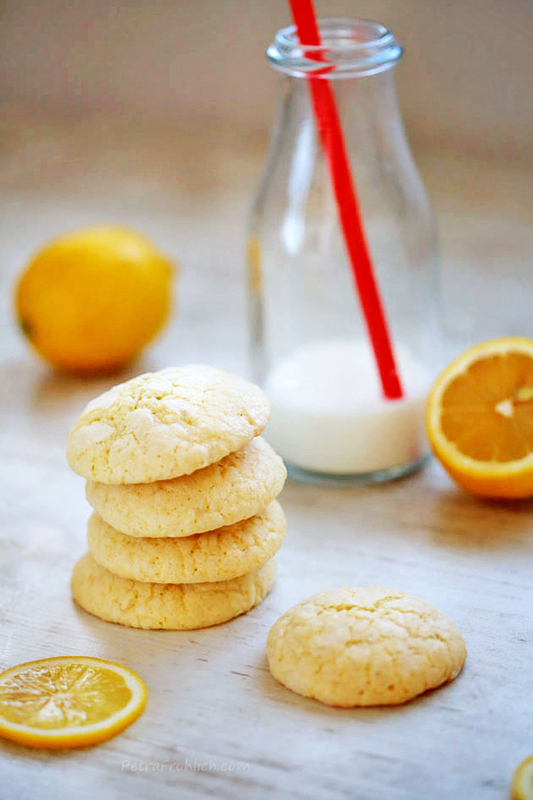 To bring these yummy lemon cookies into your life, feel free to follow the directions below. Preheat the oven to 350 °F (175 °C). Line cookie sheets with parchment paper. Beat in the egg, vanilla extract, lemon juice and lemon zest. 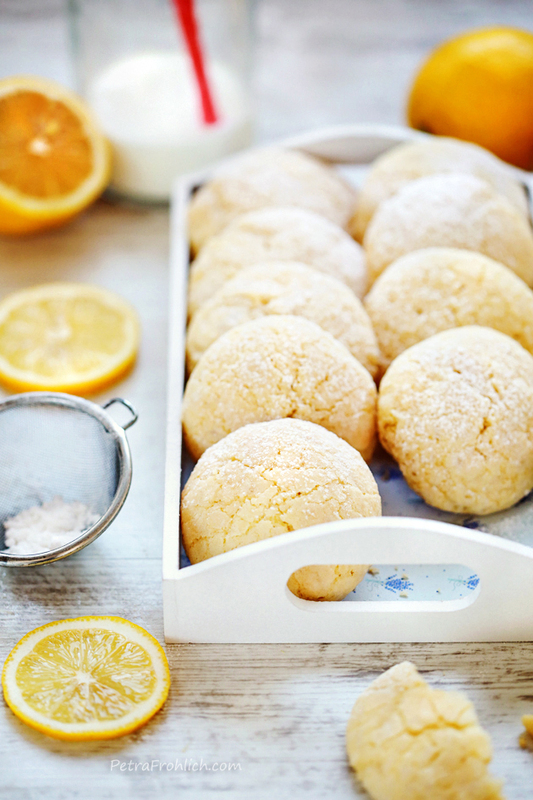 Roll 1½-teaspoon portions of dough into balls, and roll each one in the confectioners sugar. Place on lined cookie sheets about 1½ inches (4 cm) apart. Bake 10 minutes in the preheated oven, or until lightly browned. Remove from the oven and let stand on the cookie sheet two minutes before removing to cool on wire racks. 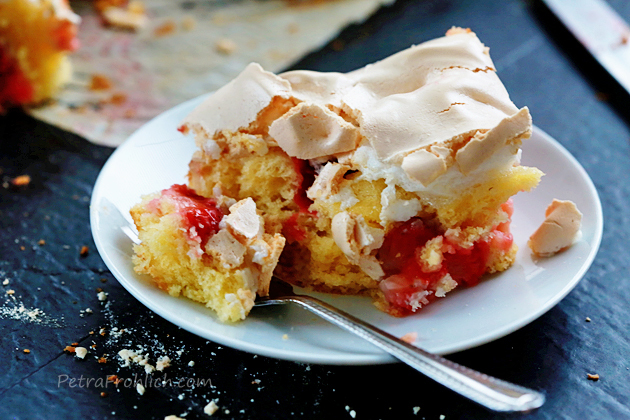 This lovely recipe was adapted from www.mybakingaddiction.com. 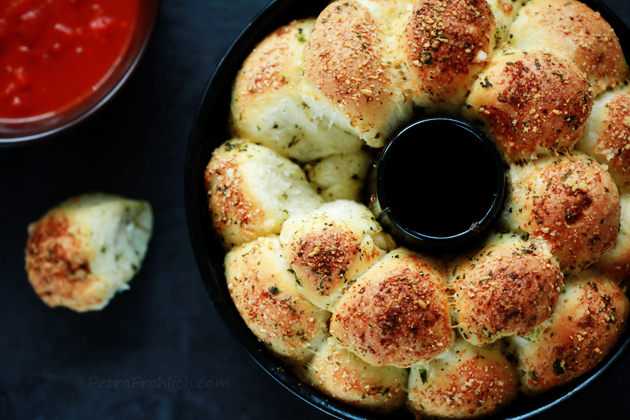 Pull-apart breads are a great love of mine. They look amazing, they are so much fun to make and the actual ‘pulling apart’ while you eat them is an immensely enjoyable and exciting thing too. 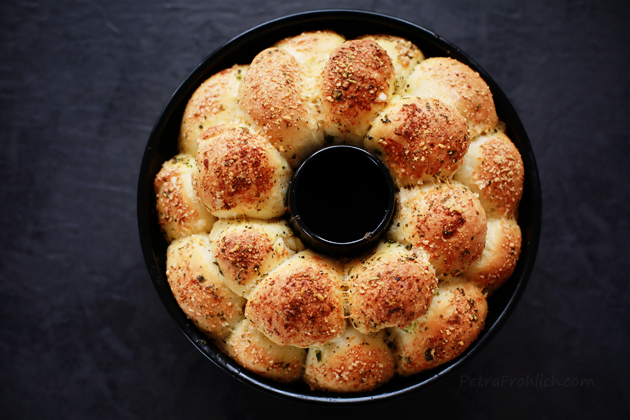 This Garlic Parmesan Pull-Apart Bread is as light as a feather, with each piece covered in a heavenly mixture of butter, herbs, garlic and Parmesan. 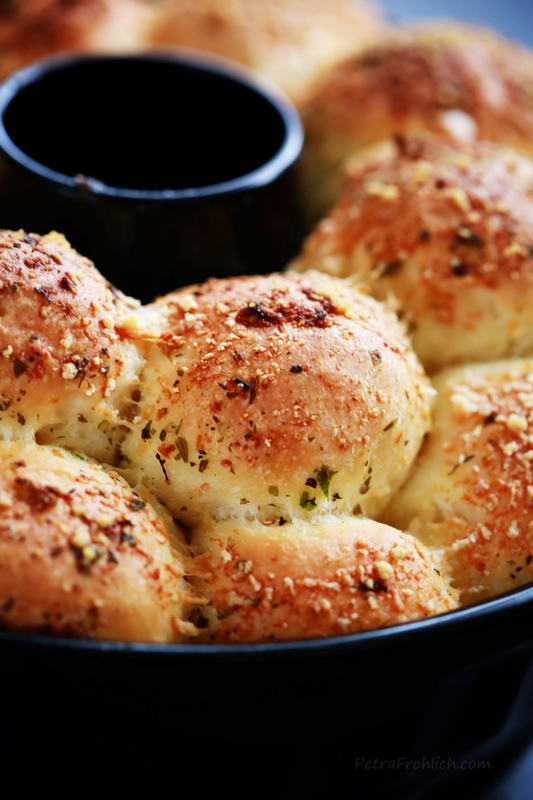 To make the Garlic Parmesan Pull-Apart Bread, first, in the bowl of your electric mixer, stir together the yeast and warm milk. Let the mixture sit for 5 minutes. Mix in the olive oil, 2 tsp salt and flour. Using the dough hook, knead the dough for 5 minutes, or until elastic (alternatively, you can mix the ingredients in a large bowl and knead by hand until it is elastic, about 10 minutes, which is what I did… there’s something very magical and therapeutic in working with dough). Transfer the dough to a lightly oiled bowl and cover with a clean kitchen towel or plastic wrap. 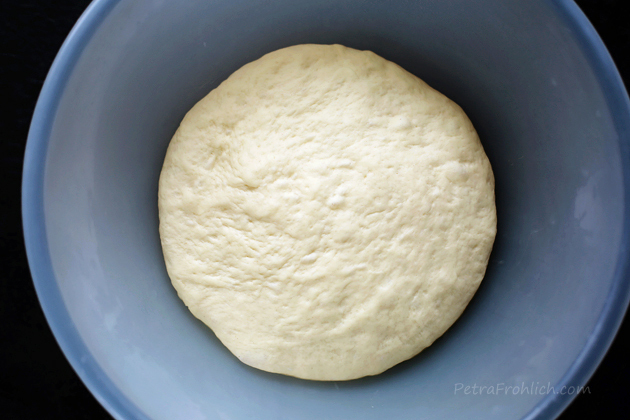 Allow the dough to rise for 1 to 1 ½ hours, or until it has doubled in size. 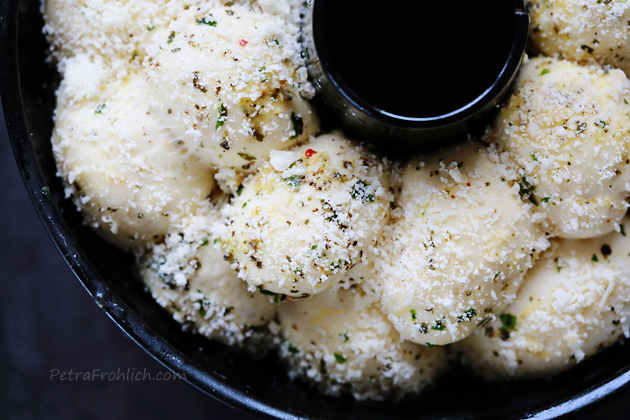 In a small bowl, combine melted butter, parsley, ½ tsp salt, Italian seasoning and minced garlic. Set aside. Gently push the air out of the dough. Roll the dough into a long log and cut it into about 27 pieces. 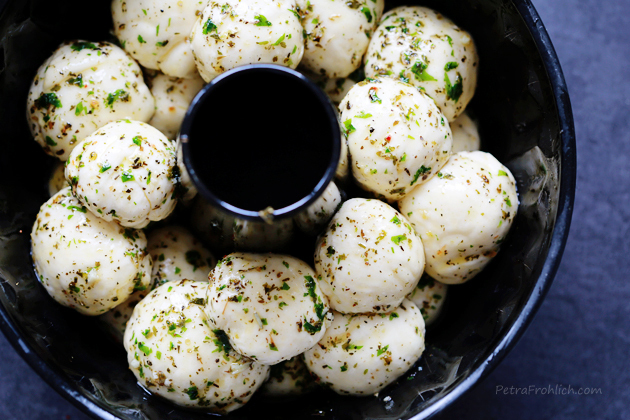 Roll each piece into a ball (or just simply tear off golf ball-sized pieces of dough and roll them into balls). …and place in the bundt pan. Anyway, arrange the dough balls in three layers. This is the first one. And this is all three of them. Give each layer a nice sprinkling of Parmesan cheese (someone, who will remain nameless, forgot to do that with her/his first 2 layers… do not be like her/him please). Cover the pan with a clean towel or plastic wrap and allow the dough to rise for about 20-30 minutes. Bake for 25 to 30 minutes, or until the bread is golden brown. Mmmmmmm. 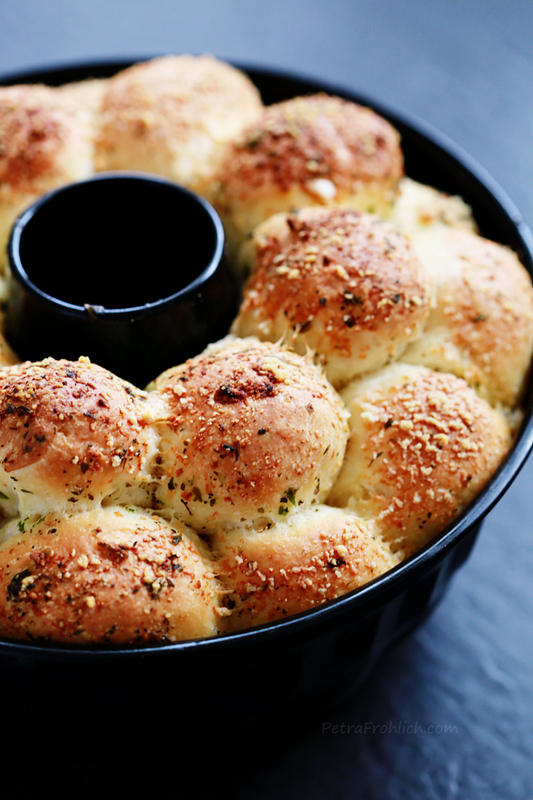 The wonderful smell of freshly baked bread, cheese and garlic will fill your house. Let the pan cool on the wire rack for about 5 minutes. 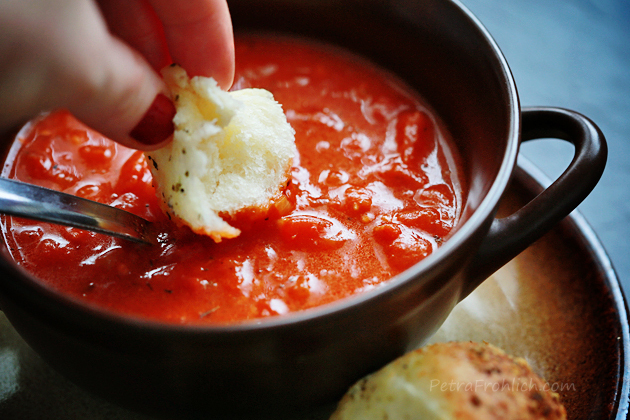 Serve directly from the pan or invert the pan onto a large serving plate and let the bread fall out of the pan. Pulling the bread apart is so much fun! It definitely was for me. 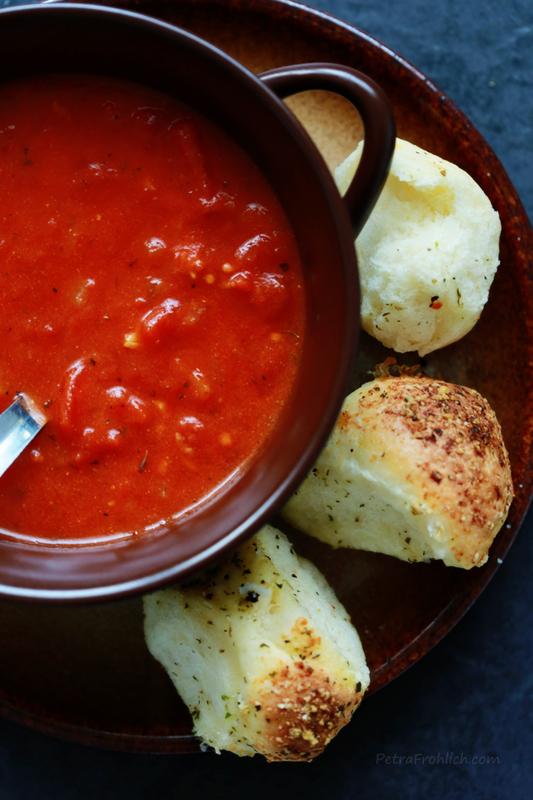 I served my pull-apart bread with this yummy tomato soup. They made a great pair together. The bread was soft and light as a feather. And each piece was full of amazing flavors. … If you find it handy, here’s the recipe in the printable form. 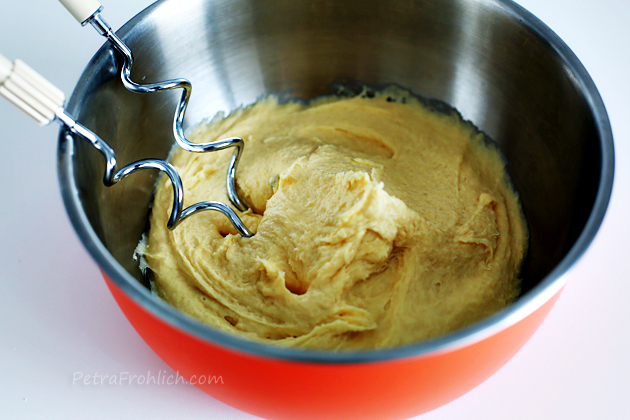 In the bowl of your electric mixer, stir together the yeast and warm milk. Let the mixture sit for 5 minutes. Mix in the olive oil, 2 tsp salt and flour. 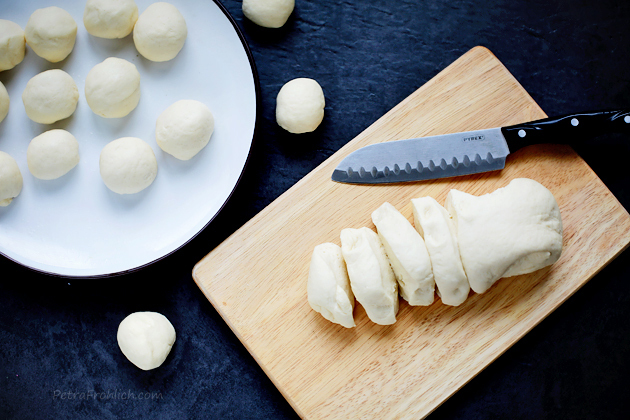 Using the dough hook, knead the dough for 5 minutes, or until elastic (alternatively, you can mix the ingredients in a large bowl and knead by hand until it is elastic, about 10 minutes). 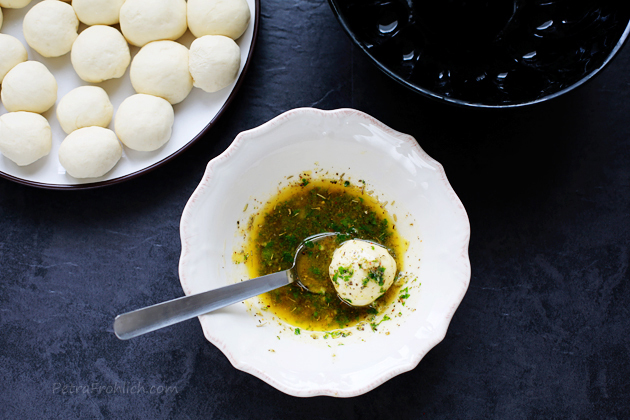 Transfer the dough to a lightly oiled bowl and cover with a clean kitchen towel or plastic wrap. 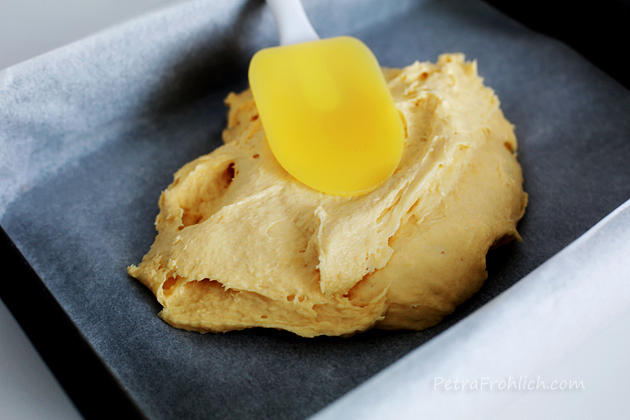 Allow the dough to rise for 1 to 1 ½ hours, or until it has doubled in size. 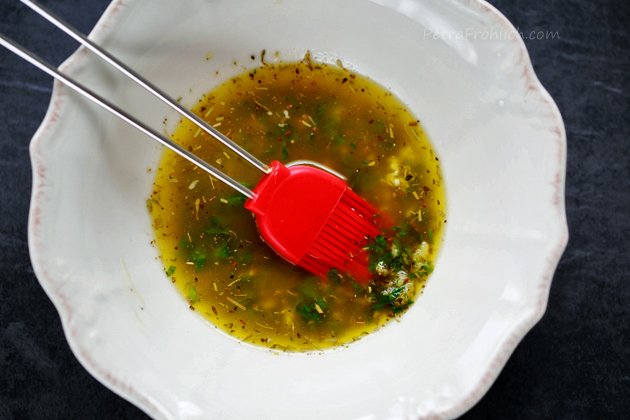 In a small bowl, combine melted butter, parsley, ½ tsp salt, Italian seasoning, and minced garlic. Set aside. Gently push the air out of the dough. Roll the dough into a long log and cut it into about 27 pieces. 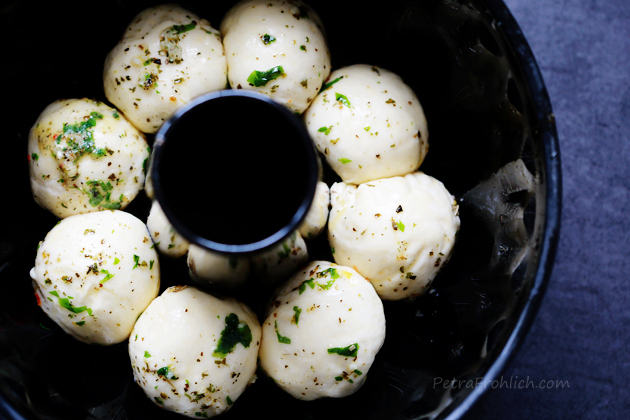 Roll each piece into a ball (or just simply tear off golf ball-sized pieces of dough and roll them into balls). Then, one by one, roll each ball in the butter mixture and place in the bundt pan in 3 layers, sprinkling each layer with about ⅓ of Parmesan. Cover the pan with a clean towel or plastic wrap and allow the dough to rise for about 20-30 minutes. Bake for 25 to 30 minutes, or until the bread is golden brown. Let the pan cool on the wire rack for about 5 minutes. 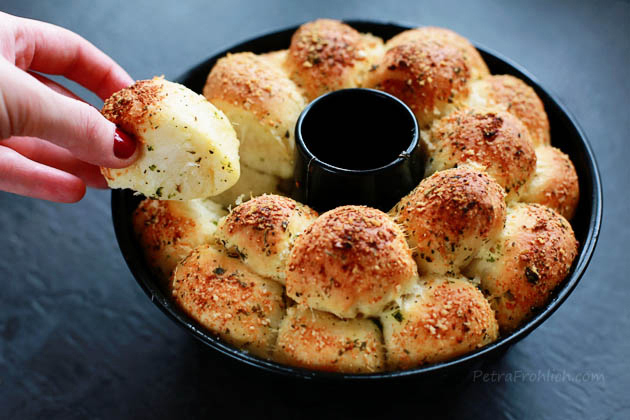 Serve directly from the pan or invert the pan onto a large serving plate and let the bread fall out of the pan. Serve hot. 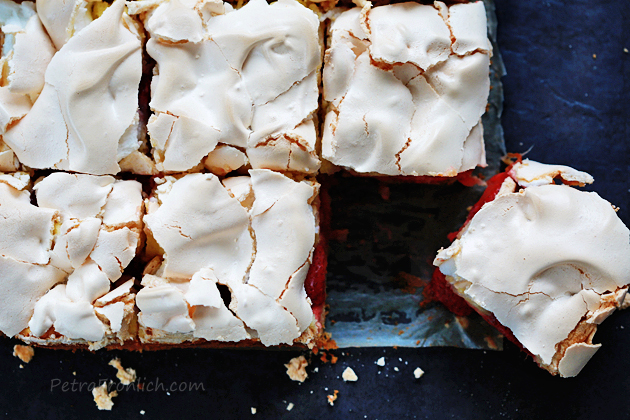 By making this recipe you will be rewarded with wonderful cake squares where the bottom layer is as light as a cloud, fluffy and full of vanilla flavor. 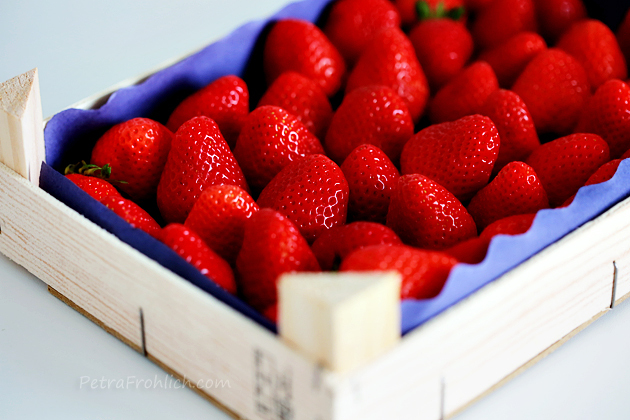 There will be strawberries mixed in to add freshness and the most amazing scent. 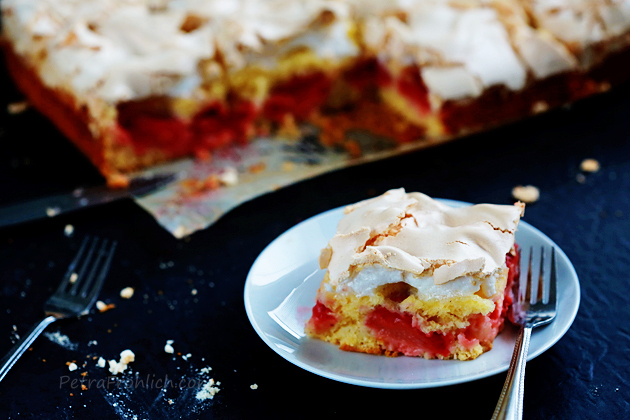 And it will all be generously covered with a layer of luscious meringue, crispy on top and beautifully soft underneath, that will melt in your mouth as you eat it. 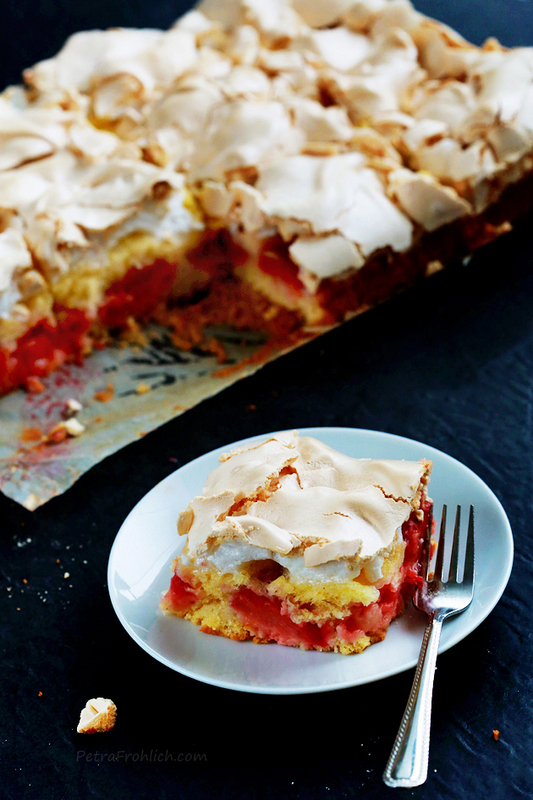 This cake is an adventure, something new and sinful in every layer. 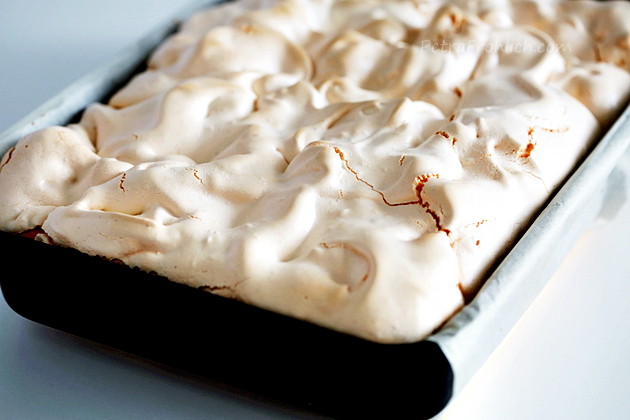 Line a 13 x 9 x 2-inch (32 x 23 x 5-cm) baking pan with parchment paper – cut a length of parchment paper long enough to line the bottom of the pan with extra hanging over the sides (it will be used to remove the cake from the baking pan once it’s baked). 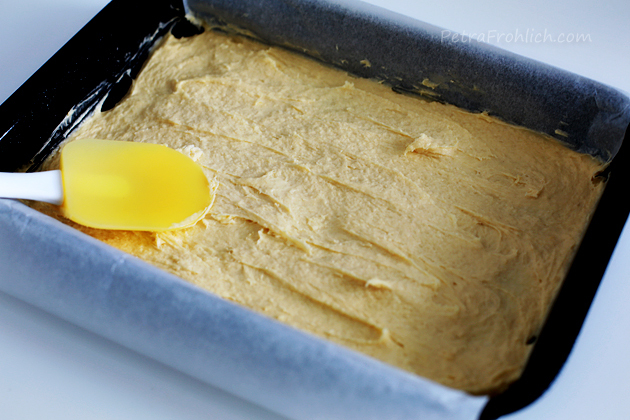 Pour the dough in the baking pan. Spread it over the bottom of the pan evenly. And now onto the lovely delicious strawberries. 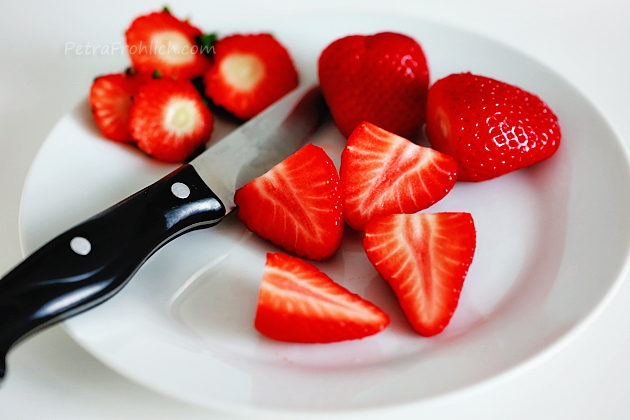 Rinse the strawberries, cut off the tops and halve them. 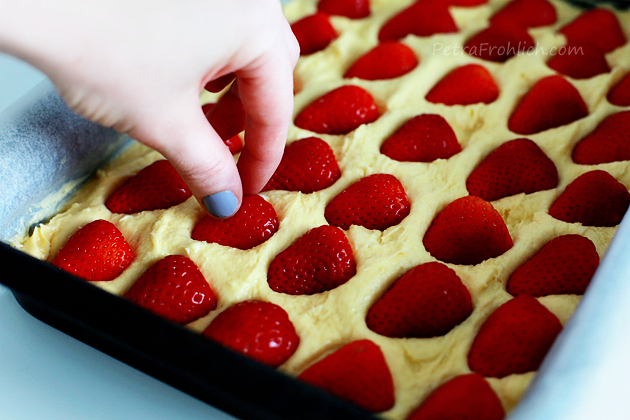 Press the strawberry halves into the dough. Set the baking pan aside and allow the dough to rise for about 1 hour. When the dough has risen, preheat the oven to 320 °F (160 °C), with the rack placed in the bottom third of the oven. Whisk the egg whites until stiff peaks, then add 2 cups + 1 tbsp (250 grams) confectioners sugar and whisk until soft peaks. 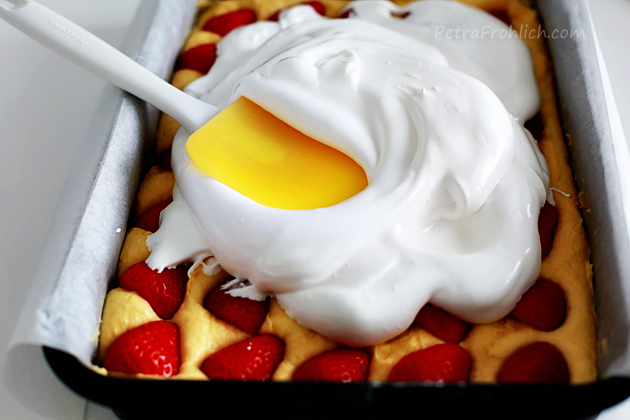 Pour the egg white mixture over the strawberry dough. Then, using a tablespoon, form peaks on the surface. Place the baking pan in the lower third of the oven and bake for 45 minutes. 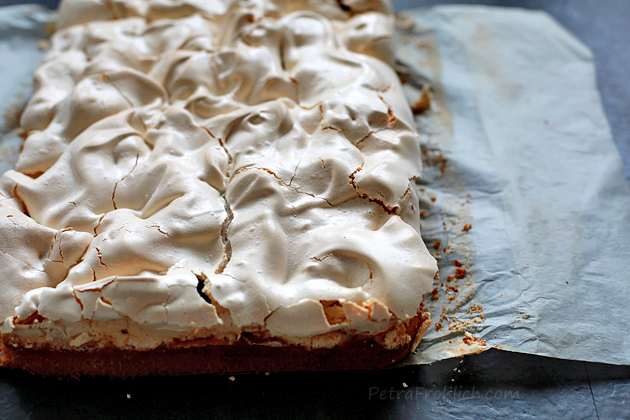 If the top of the meringue gets too brown, cover it with aluminum foil. 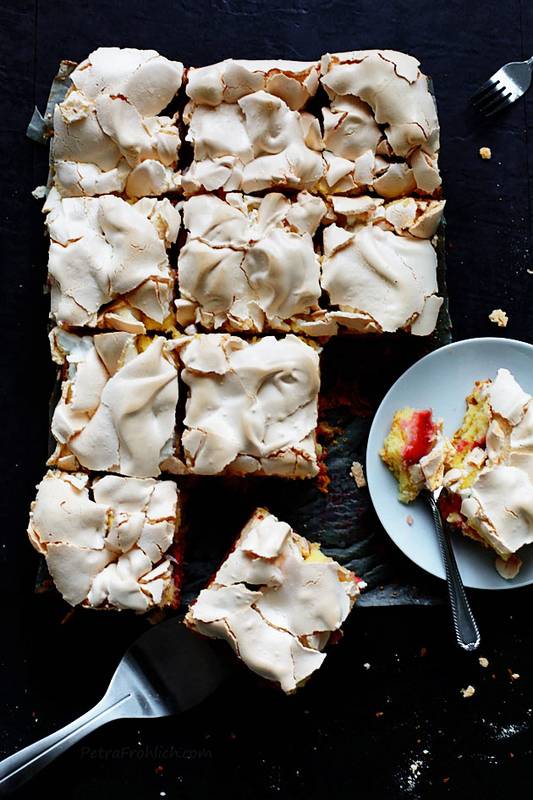 Remove the cake from the oven and let cool. Use the extra hanging of the parchment paper on the sides to remove the cake from the baking pan. Line a 13 x 9 x 2-inch (32 x 23 x 5-cm) baking pan with parchment paper - cut a length of parchment paper long enough to line the bottom of the pan with extra hanging over the sides (it will be used to remove the cake from the baking pan once it's baked). 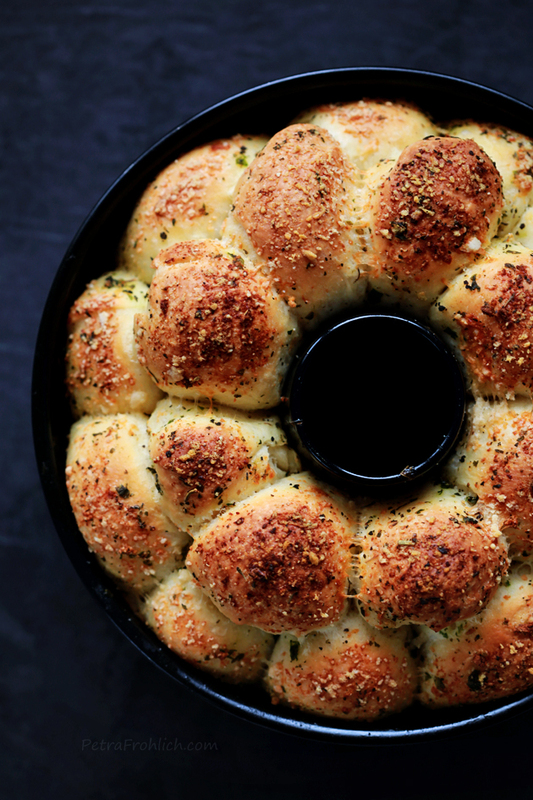 Pour the dough in the baking pan and spread it over the bottom evenly. 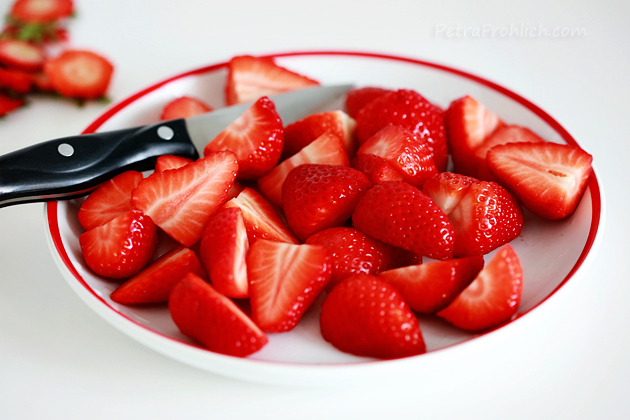 Rinse and halve the strawberries. Press them into the dough. 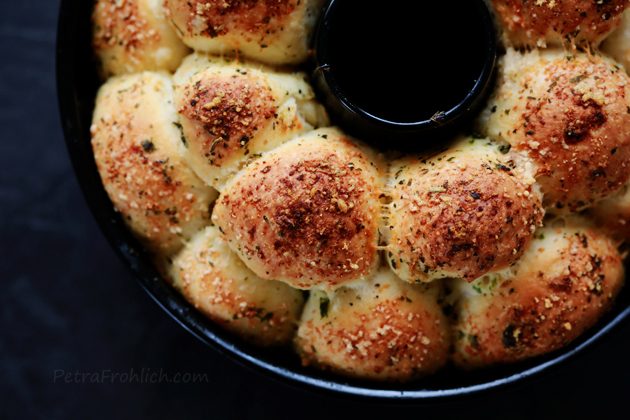 Set the baking pan aside and allow the dough to rise for 1 hour. 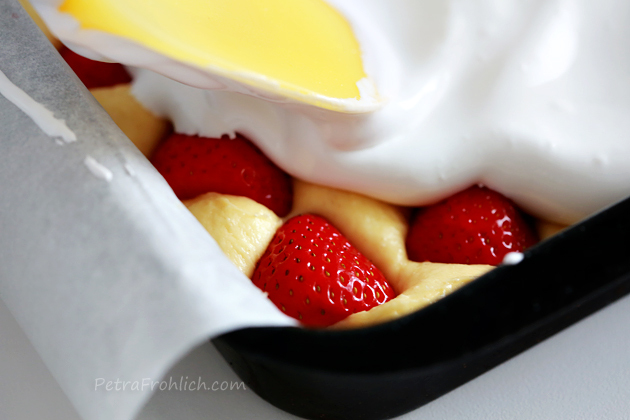 Pour the egg white mixture over the strawberry dough, even it out. 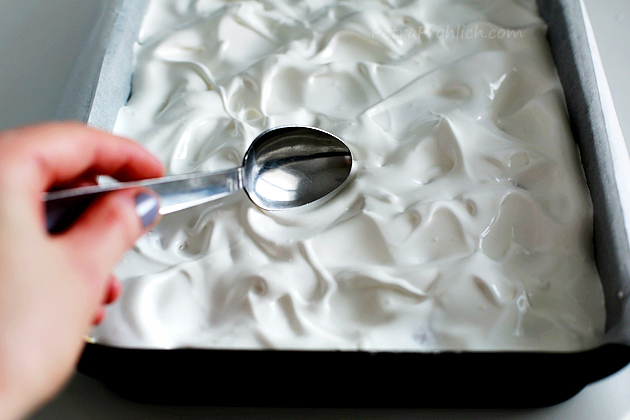 Then, using a tablespoon, form peaks on the surface. 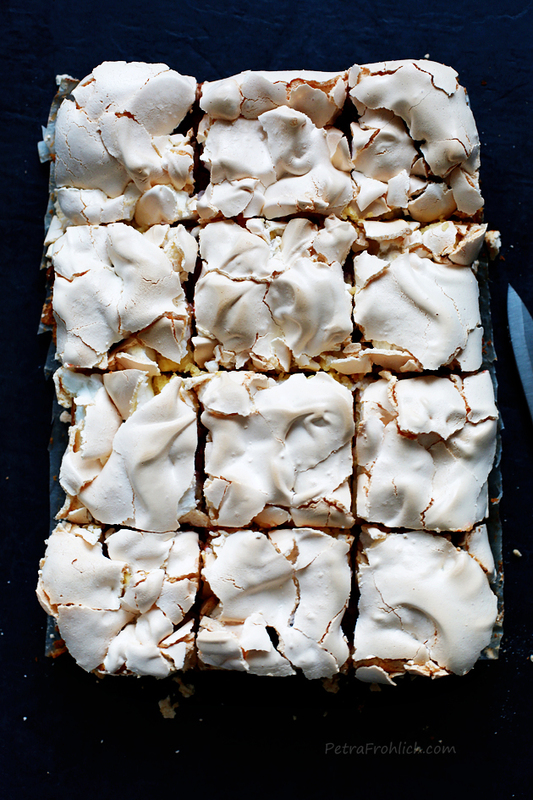 Remove the cake from the oven and let cool. Use the extra hanging of the parchment paper on the sides to remove the cake from the baking pan. Cut into squares!